Ever dread the thought of tapping out a text or replying to email on your slippery Android touchscreen? I know the feeling. Here’s a half-dozen ways to make life easier on your fingertips, from long-pressing your way to the symbol keys to letting your voice do the typing. Need an accent above a vowel, or just a quick number or two? Try this: tap and hold a key to reveal a pop-up menu of additional options. For example, if you tap and hold a letter key along the top row of the keypad, you’ll get a shortcut for the number that shares space on that particular key. Meanwhile, you can long-press any vowel key—say, “e”—for acute (“é”) and grave (“è”) accents, as well as umlauts (“ë”), circumflex (“ê”), and more. You can also try the same trick with symbol keys. Tap and hold the dash key (“-“), for example, and you’ll find an em dash (“—”), while long-pressing the dollar sign (“$”) reveals symbols for the euro, the Japanese yen, and the British pound, among others. Last but not least, tap and hold the period for a pop-up menu of many common symbol keys, including parenthesis, the colon and semicolon, the pound sign, and quotes. Just double-click the shift key to switch to all-caps mode. Want to type in ALL CAPS? Not a problem. Just double-tap the shift key. When you do, a telltale blue indicator will light up, and all the letter keys will jump into upper-case mode. Ready to return to lowercase? Tap the shift key once more. As you type, most Android phones will display a row of alternate spelling possibilities just above the keyboard; tap one, and it’ll replace the word you’re typing (or mangling, as the case may be). You can turn off Android’s “auto-correct” feature in just a few taps. 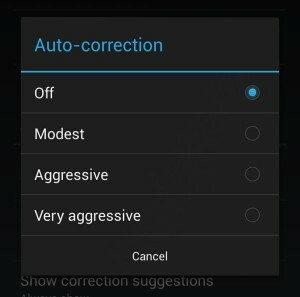 A pop-up menu will give you a series of auto-correct options, from “Modest” to “Very aggressive.” The setting we’re looking for, though, is “Off.” Go ahead and tap it. And don’t worry: you’ll still see a row of word suggestions above the keyboard, even with auto-correct disabled. Don’t have a free hand for tapping out a text message? Well, there’s always the power of speech. In the bottom-left corner of most recent Android phones, you’ll find a key stamped with a microphone icon. Tap it and start talking—and as you do, your phone will listen carefully and start transcribing your words on the screen. The results may not be perfect, and you may have to resort to tapping to replace a word or two. That said, Android’s “voice recognition” feature can be uncannily accurate—and unlike the iPhone, Android will let you voice-type even without a data connection. 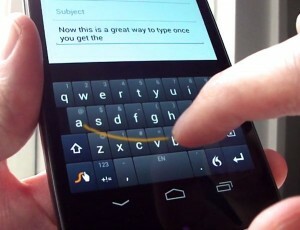 Even if you don’t have the latest version of Android on your phone, Swype will let you do the “swipe-to-type” trick on your handset. Is tapping on your Android phone’s virtual keypad slowing you down? Here’s a way to speed up your touchscreen words-per-minute: swiping instead of typing. “Gesture Typing,” a feature in the latest version of Android, lets you swipe smoothly from one letter to the next, almost like you’re drawing words rather than typing them. 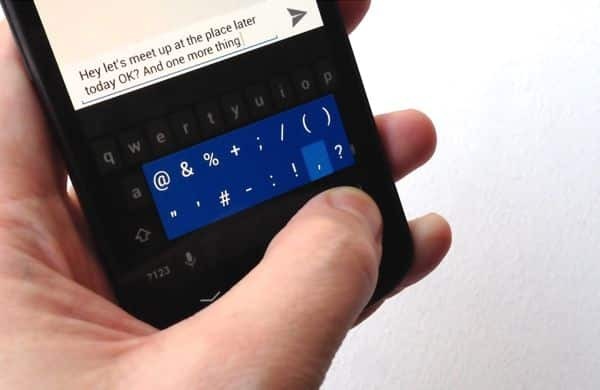 For using an older Android phone, there’s always Swype, a downloadable Android add-on that also lets you do the swipe-to-type trick. Getting tired of typing out your street address over and over, or wish you could type a phrase like “On my way!” in just a few taps? Using the “Personal dictionary” feature on newer Android phones, you can designate your own, custom keyboard shortcuts, good for anything from common phrases to your job title. For example, you can tap “omw” to insert the phrase “on my way” into a text or email message, or type “addr” (or anything you want) to call up your home address. Want to give it a try? Click here for step-by-step instructions.